Share the post "Commercial Flower"
Some may think all Realtors just set around waiting for the phone to ring from a prospective buyer who’ll look at a home once, and then follow them back to their office to buy it, and then remain seated again for another 30 days until the closing day arrives, and then go pick up their commission checks. In my world, that couldn’t be farther from the truth. Over these past several days I found myself called to get a build-up of water marks off the front of a stainless steel refrigerator, along with making sure the ice maker worked after not having been used for months on end. One thing I did discover about those dispensers, is that it’s best to get all the ice out of the hopper after shutting off the ice making mechanism. If not, those old ice cubes turn into a block of ice and plug the dispenser. I can now say on both counts the refrigerator is back to looking normal and working properly. I thought I’d have several new listings posted today, but there were several hold-ups on both of them to where hopefully I’ll have one posted tomorrow, and perhaps another later this week. We just can’t do much about intervening circumstances, so we just have to work around those hiccups and keep moving forward. Once again, another Downtown businessperson approached me today about the shortage of housing we’re experiencing in Mason City. We spoke about the limited incomes of many who can only afford to buy in certain price levels, the rising costs of goods and services, and now the rising interest rates. I mentioned how sad I am for many who’ll likely be trapped in their vicious circles of paying higher and higher rents which give them no room to save for their down-payments on the homes they’d like to buy. I’m finding a group of younger ones who’ve managed to pull themselves up a bit, getting into the rental housing game. I fear they’re trying to mimic some of our existing slum lords. I’ve come to believe nearly all of them share the same thread–greed. They don’t want to be part of helping others lift themselves up, but rather they take as much as possible from those who just plain and simply want a better life. I find nothing inspirational about this new breed of slumlords because all I see are copycats following the footsteps of our City’s big “Tom Cat” rental barons. As chance would have it, I had my camera with me as I was driving past a home that I’ve been familiar with for many years. The owner was outside, so I stopped and asked if I could take a photo of her peonies. Since I’d sold her the home many years ago, she remembered the story I passed along to her regarding those peonies. The previous owner had lived in that home for over 50 years, and mentioned when he was young, those peony plant starters were a gift to him from his grandmother out of her garden. 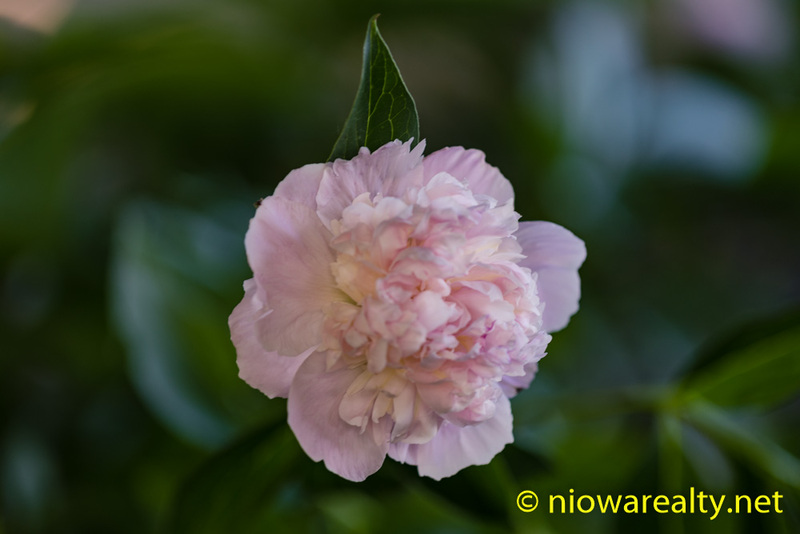 The above photo is of a peony blossom out of her garden which is of the more vintage variety. Isn’t it interesting how the commercial flower growers are always creating new and “improved” versions of the old which I believe are just as appealing. Don’t you this so?